I have been in contact with Dr. Restifo and he was so generous to share his Research papers with us. As I started to read this one, I thought it would be better to put it in the shared file on Melanoma Missionary. I think it may interest many patients. Thanks for the update of your analysis of the work. Have you had any luck posting this on the Wiki site? Here’s a stack of some of our recent papers. Almost all of our papers before 2008 are available on www.pubmed.org. The most interesting data was on ipiliumumab (abstract #9033), which looked at the effect of the agent on 18 and 24 month survival from 3 phase II trials dosed at 10mg/kg every 3 weeks (plus maintenance therapy Q12W from week 24 in appropriate patients) in advanced melanoma, where survival outcomes are usually poor. 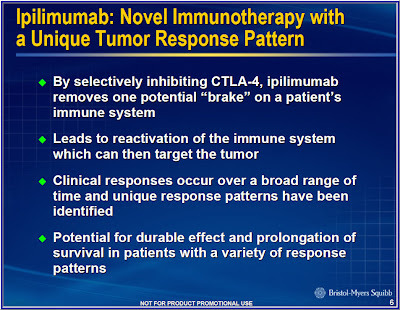 Ipilumumab is a fully humanised monoclonal antibody that targets T-lymphocyte antigen 4 (CTLA-4). The 3 studies summarised were CA184-008, CA184-022, CA184-007. "For previously treated patients, 24 month survival rates ranged from 24% to 33%. Long term survivors included patients with progressive disease according to WHO criteria. These results are promising but caution must be extended because a significant number of patients were lost to follow-up, which may reduce the reliability of the results. Ongoing biomarker studies are looking at predicting which patients are most likely to benefit from ipilumumab therapy. What did we learn from these trials? Well, there is an urgent need to define optimal endpoints for melanoma clinical trials in terms of response rate, PFS, OS and survival at 12 months. It is interesting that over the past 10 years the majority of abstracts have hyped the results in this disease as 'promising' or 'clinically active' regimens and yet very little in the way of new therapies have actually been approved by the FDA. 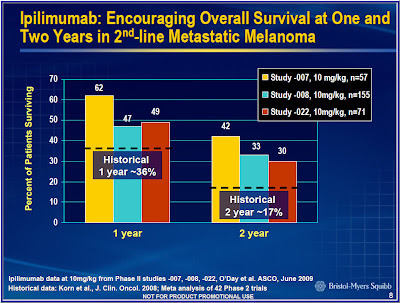 Based on these data, I suspect it will still be a little while before we see some solid phase III data in malignant melanoma." I got my Christmas Wish!!!!!!!!!!!!!!!!! Mike Weber was kind to forward your paper and email. It appears that you have a very good sense of, and interest in, the immune response to melanoma and to cancer in general. I believe you are right that timing of the various components of the immune response, especially with combination therapies, is important, just as it is in the orchestration of a beautiful symphony. I wish you success in your treatments and in your work to understand and to explain the immune response to cancer. Craig L. Slingluff, Jr. M.D. The Weber laboratory utilizes tools of cell biology, protein chemistry and molecular biology to understand how signal transduction pathways control cell growth and apoptosis and how these controls are altered in cancer. A major focus of this research is on the MAP Kinase cascade, a ubiquitous signaling pathway that generates specific biological outcomes dependent on biological context. Recent findings of the lab have demonstrated an important role for "scaffolding proteins" that assemble components of the signaling cascades. They recently discovered the MORG1 scaffold protein (MAP Kinase Organizer) that regulates responses to LPA but not EGF. Signaling scaffolds can control the location, regulation, timing, substrates, biological functions, and suitability for therapeutic intervention of a signaling pathway. This research made use of the Biostatistics Core, to help evaluate multi-factorial responses to mitogens, and the Mass Spec and DNA cores for molecular and proteomic analysis. The lab pioneered the use of phosphorylation-site specific antibodies to probe archival paraffin-embedded pathology specimens, and discovered that the MAP Kinase cascade was activated in prostate cancer. Activation of this pathway is sufficient for and can be necessary for progression of prostate cancer to an androgen-independent disease. Therefore the Ras-MAP Kinase pathway is an attractive target for therapy of advanced prostate cancer. Current research aims to determine how to select combinations of therapies in cancer treatment. It's Christmas.. SentoClone may be Coming to Town!!!! SentoClone AB is a Swedish biotech company developing a patented immunotherapy for cancer treatment based on autologous T lymphocytes extracted from the sentinel node, the first tumor draining lymph node. The sentinel node is resected in conjunction with tumor reducing surgery. The extracted lymphocytes are cultivated in vitro and activated. The activated lymphocytes multiply and are given back to the patient after 4 to 6 weeks by a simple transfusion. So far, more than 110 patients have been treated. As the therapy is based on autologous cells, significant side effects are not expected and have not been seen. A randomised controlled phase II study in advanced malignant melanoma has recently been started and further studies are planned in other indications. Today might be the worst day of your life...but tomorrow could be the best. You just have to get there." 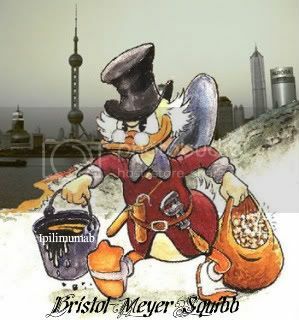 Is Bristol-Meyer Squibb the New Dr. Kevorkian of the Decade? As a Melanoma Patient and a survivor, I believe BMS is the New Dr. Kevorkian. They are killing cancer patients that have no other alternative and Anti-CTLA-4 blockage was their last hope. With Bristol-Meyer Squibb not allowing compassionate drug use, they are invoking a death sentence on the cancer patient. Since Pfizer pulled out of this therapy due to the fact they wanted the drug as a monotherapy when the scientific data suggests that a combination of this drug would have better results. So BMS now has a monopoly on this drug and will be able to charge a great deal for it even though it is made in thousands of units per batch. When will the FDA coming in and do what is ethical for the country? We cannot let a deceitful and greedy company control our destiny. PBM Products, LLC, has received a favorable jury verdict and a $13.5 million damages award in its false advertising lawsuit against Mead Johnson & Co., the operating subsidiary of Mead Johnson Nutrition Company (NYSE: MJN), the makers of the national-brand Enfamil(R) LIPIL(R) Infant Formula. Mead Johnson is 83 percent-owned by Bristol-Myers Squibb (NYSE: BMY). PBM's lawsuit claimed that Mead Johnson engaged in false and misleading campaigns against PBM's competing store-brand of infant formulas, suggesting they do not provide the same nutrition as Mead Johnson's brands. PBM's store-brand infant formulas cost up to 50 percent less than Enfamil(R) LIPIL(R). The $13.5 million in damages awarded by the jury in the United States District Court for the Eastern District of Virginia is one of the largest damages awards ever for a false advertising case. If BMS is willing to mislead on baby formula, Can you believe that they was ever a Ipilimumab Shortage? I see a pattern of misleading the public over the last decade from Bristol-Meyer Squibb. Researchers identify the first successful end of a human patient’s cloned infection-fighting T cells as the sole psychotherapy to snap an advanced through-and-through-tumor cancer into long-term exemption. A body led by Cassian Yee, M.D., an associate member of the Clinical Research Division at Fred Hutchinson Cancer Research Center, reports these findings in the June 19 issue of the New England Journal of Medicine. Yee and colleagues removed CD4+ T cells, a type of white blood cell, from a 52-year-old man whose Stage 4 melanoma had spread to a groin lymph node and to a lung. T cells specific to targeting the melanoma were then expanded vastly in the laboratory using modifications to existing methods. The lab-grown cells were then infused into the patient with no additional pre- or post-conditioning therapies, such as growth-factor or cytokine treatment. Two months later, PET and CT scans revealed no tumors. The patient remained disease free two years later, when he was last checked. Yee cautioned that these results, presented in the journal’s “Brief Report” section, represent only one patient with a specific type of immune system whose tumor cells expressed a specific antigen. More studies are needed to confirm the effectiveness of the experimental T-cell therapy. If proven successful in more patients, Yee predicted this therapy could be used for the 25 percent of all late-stage melanoma patients who have the same immune-system type and tumor antigen. Using a patient’s own immune system to combat cancer, called immunotherapy, is a growing area of research that aims to develop less-toxic cancer treatments than standard chemotherapy and radiation. The patient in the journal report was one of nine patients with metastatic melanoma who were being treated in a recently completed clinical trial to test dose- escalation of autologous CD4+ T cells. Earlier studies performed by Yee used CD8+ T cells, which do not persist in the body without the support of CD4+ T cells or growth factors such as interleukin 2. Yee and colleagues theorized that infusion of a massive dose of CD4+ T cells would persist longer in the body because they make their own growth factor, interleukin 2, while stimulating the anti-tumor effect of the patient’s existing CD8+ T cells. However, until recently there was no feasible way to isolate and expand anti-tumor CD4+ T cells in the lab. The researchers were successful in all of these areas. The patient received a dose of 5 billion cloned CD4+ T cells with specificity for the melanoma-associated NY-ESO-1 antigen. The cells persisted for at least 80 days in the patient’s body. And, even though only 50 percent to 75 percent of the patient’s tumor cells expressed the NY-ESO-1 antigen, the entire tumor regressed following the infusion. The scientists postulated that the patient’s immune response was broadened to other antigens expressed by the tumor cells. Follow-up tests showed T-cell responses to two additional tumor antigens, MAGE-3 and MART-1. Researchers in Yee’s lab, the University of Washington School of Medicine and the Ludwig Institute for Cancer Research in New York collaborated on the research. The Burroughs-Wellcome Foundation, Damon Runyon Cancer Research Foundation, Edson Foundation and National Cancer Institute funded the study. Quote of the week - and It's only Monday morning! "When you marry the devil's daughter don't be surprised when your father-in-law comes to visit." Editor's Note: Sequence of events: (A) Bristol hires author/bipolar patient to tell the world how great Abilify is, pays him $10K per day in speaking fees and he tells everyone it is the best thing since sliced bread. (B) His contract is over and he demands $7.5 million to renew; BMS tells him to shove it. (C) Now he's going around saying that he lied all along and Abilify hade him feel like crap. Bottom Line: When you marry the devil's daughter don't be surprised when your father-in-law comes to visit. This happened in 2009. BMS still has not changes it's way of doing business. It is all about the bottom-line and how to make a profit. 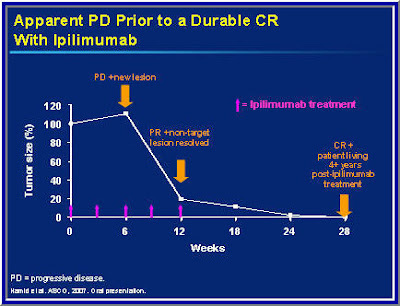 Now think about the Ipilimumab Shortage. Go to the Clininal Trial website and see all the trials started after the shortage/ stoppage of the the compassionate drug use (Ipilimumab). Patients have died due to the fact they did not have access to Ipilimumab. BMS only cares about the bottom-line. What about what is ethically right? They are the Tiger Woods of the pharma companies.We should boycott them. While base on your environmental standards Bristol-Meyers Squibb is worthy of an A+, their Ethical conduct should be also taken into account. As a patient of stage IV Melanoma Cancer, I saw firsthand what BMS is all about. It is greed and the bottom line and the “string of Pearls”. They chose to close the compassionate drug use (Ipilimumab). They told the public and the Government that they were having trouble producing the drug, but proceeded to startup new Clinical trials with the drug after they stopped compassionate drug use. How ethical is that? They even went as far to respond to a patient’s family with this response;” Jimmy, remember what the BMS "doctor" told me "Mrs. Lawrence, you will get the drug for your husband when we can charge for it." BMS is only looking out for their bottom-line and to hell with patients. So with this information, BMS in my opinion is only worth a C- to a D+, not an A+. You can’t just use what they say on their website. You need to do real research. The information on their website is skewed in the drug companies favor. In this Holiday Season there is a Scrooge among us. It is the Bristol-Meyer Squibb. In September of 2008 they stopped compassionate drug use (Ipilimumab) because they claimed that they were having trouble producing it. It has come to light that their major intension was to stop giving it away until they could get paid for it. The Shortage was a Magic act. Now it’s there and now it’s not. To make matters worse, The FDA was contacted and never really looked into the Shortage. Did they turn blind eye or are they short staffed? Bristol-Meyer Squibb is committed to their bottom line. They are the Scrooge of the pharmaceutical Industry in my opinion. They all do it, just not as publicly as Bristol-Meyer Squibb. The company should be investigated on their ethics. 1. They mislead Government officials, the truth about the shortage? 5. 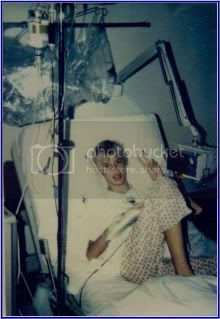 Jimmy, remember what the BMS "doctor" told me "Mrs., you will get the drug for your husband when we can charge for it." This all comes down to Ethics. Doing what is right. Researchers involved in an international multicenter clinical Phase II trial have reported a 26% response rate for patients with metastatic melanoma treated with a second-generation granulocyte-macrophage colony-stimulating factor (GM-CSF) oncolytic herpes simplex virus (HSV) vaccine. The details of this study were published in the December 1, 2009 issue of the Journal of Clinical Oncology. 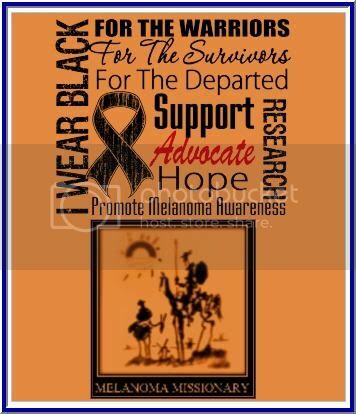 Melanoma is considered an immune responsive cancer. A small fraction of patients with metastatic disease respond to a variety of immune therapies including: Proleukin® (interleukin-2), lymphokine activated killer (LAK) cells, tumor infiltrating lymphocytes (TIL), and genetically manipulated T-cells. In addition, there have been many attempts to develop a successful vaccine. A previous Phase I study of this second-generation oncolytic HSV expressing GM-CSF was carried out in patients with a variety of solid tumors. In this study the vaccine was called OncoVEX-GM-CSF and is made by BioVex. This study established a safe dose, and responses were observed in patients with melanoma and other solid tumors. The overall response rate was 26%. Eight patients (16%) had a complete response. Five patients (10%) had a partial response. Responses occurred in injected and distant sites. 10 patients (20%) had stable disease for more than three months. 92% of responses were maintained for 7-31 months. Two additional patients had a complete response after surgery. Two additional patients with an initial partial response or stable disease achieved a complete response after 24 months of further vaccination. Overall survival at one year was 58% and 52% at two years. Comments: These are the best results achieved to date for any vaccine for melanoma. This study will by followed up by a Phase III study to confirm these results. Senzer JJ, Kaufman HL, Amatruda T, et al. Phase II clinical trial of a granulocyte-macrophage colony-stimulating factor-encoding, second-generation oncolytic herpesvirus in patients with unresectable metastatic melanoma. Journal of Clinical Oncology. 2009;27:5763-5771. Hu JC, Coffin RS, Davis CJ, et al: A phase I study of OncoVEXGM-CSF, a second-generation oncolytic herpes simplex virus expressing granulocyte macrophage colony-stimulating factor. Clin Cancer Res. 12:6737–6747, 2006.